Once these seemed to be everywhere across the country, especially in the 70's to 90's, as firstly there seemed to be a surplus of Mark 1 coaches, then the coming of the new DMUs, with the demise of loco hauled. One day, the 31st March 1984, on a visit to Didcot from the Southampton area. Taken from within the Didcot Railway Centre, with the station in the background, "W1017 COND" explains its own story. Built by BR at Swindon to Lot 1751 in 1951, the GWR Siphon G was a 'Ventilated Milk Van' NMV and was later converted to NNV for newspaper usage with dual heating and fluorescent lighting (ETH 3X). The other vans are also converted NNVs. I saw four on the day, and from inspection of the photograph, I think that the following coaches are W1048 (Lot 1768, Swindon 1955) and W1007 (Lot 1751, Swindon 1951). The fourth coach seen somewhere that day was W1335 (Lot 1721, Swindon 1950), this lasting a little longer in traffic than the three pictured. All of the above coaches were scrapped. Related: record pictures from Paul Bartlett. Moving on to Basingstoke, I explored the sidings in the yard to the south west of the station, on one later occasion the site of the Basingstoke Railfair, now under Winterthur Way, but can be seen in this map. ADB975863 is seen with all windows smashed, and generally trashed, a rather sad sight, with partner ADB975865 adjacent. 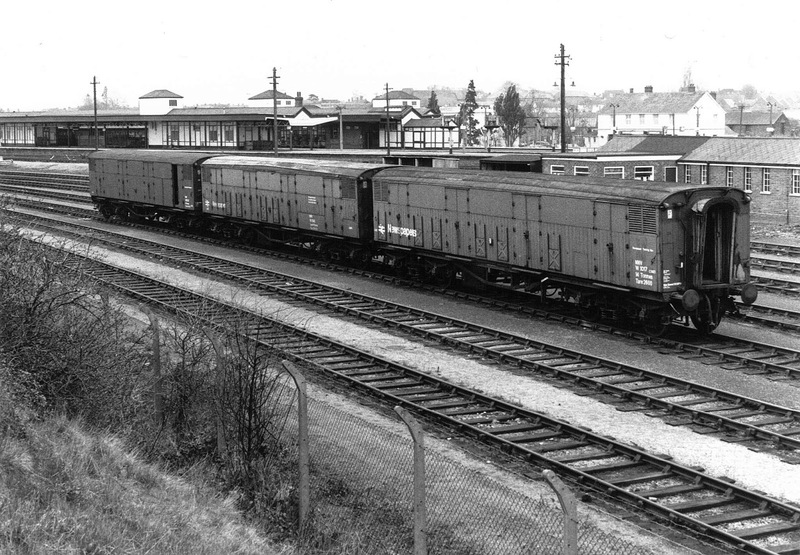 975863 was originally S3842 a TSO new from Eastleigh (frames from Ashford) to lot 30054 in January 1954. 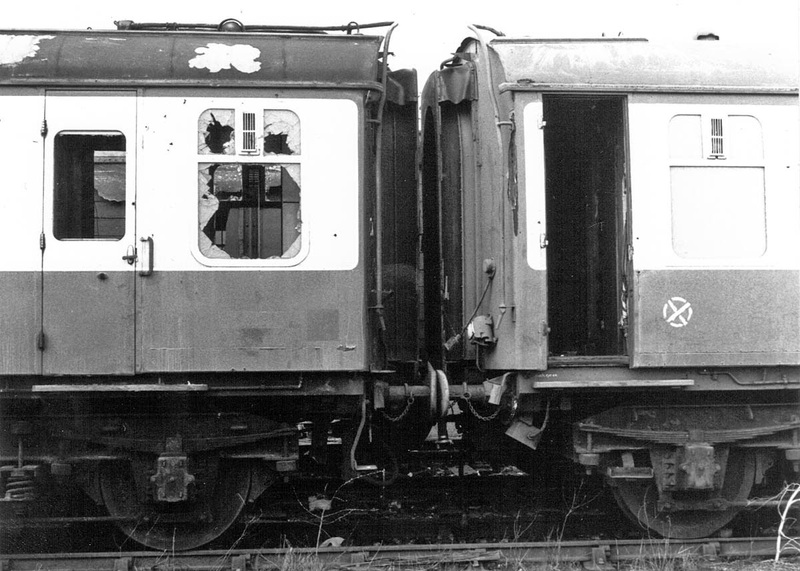 It was converted to air brake and 675V ETH in 1967. Stored from May 1977, withdrawn from and reinstated to normal traffic in November 1977 then withdrawn in July or September 1978 and converted into a barrier coach in February 1979. The air brake fit made this a candidate for barrier work for Class 508 delivery, but by this time in 1984 the new usage had clearly finished. I also noted it at Basingstoke on 19Aug85 and 05Sep85. My notes show "to Eastleigh 16Nov85". Disposal took place at Mayer Newman, Snailwell in November 1986. The next coach is ADB975865, originally S3835 also stored in May 1977, withdrawn from and reinstated to normal traffic in November 1977, then withdrawn in February 1978 after which it was converted and had similar history to 3842. Lot 30054 was S3824 - S3849, and from these 3825 has been in preservation since 1972 and 3849, of similar history to the pair seen here, is still in usage as barrier coach 975864, now mounted upon Commonwealth bogies. By 1984, of the group of 5 barrier coaches 975863-867, only 975864 & 975867 were retained and saw further usage with Class 319. The NPV (CCT) is E94637 withdrawn in 1981 and scrapped in 1988. Detail of 975865 (left) and another Mk1, likely a CK (left). This has dual heat, and is on B1 bogies. 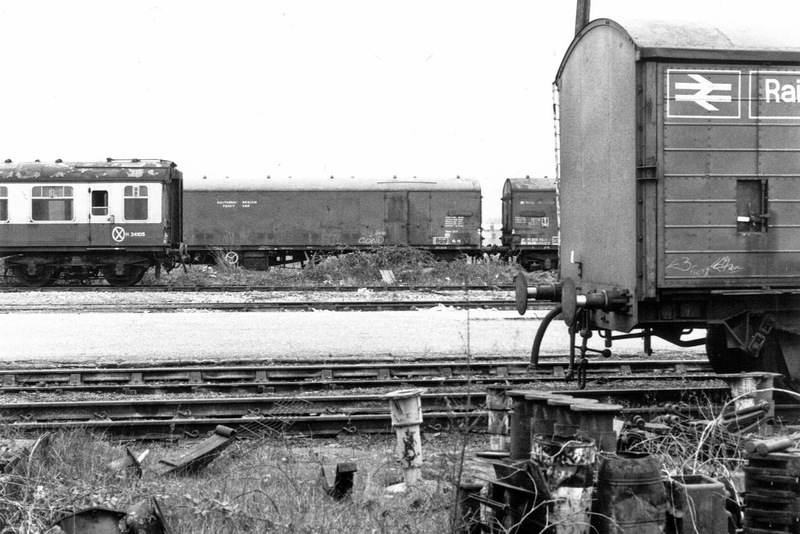 It may be S15863, condemned in 1975 and scrapped at Birds, Long Marston in 1985. This was riding on Commonwealth bogies, but these may have been recovered for further usage. 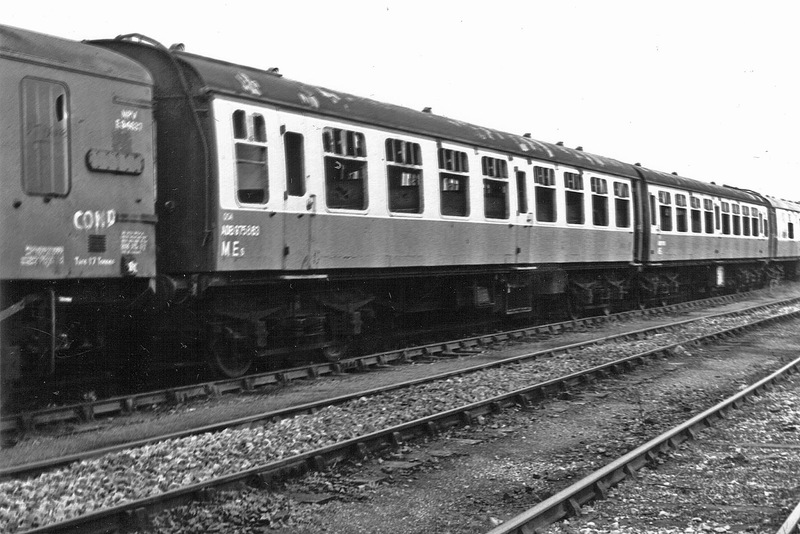 W24105 was an early SK, completed in the initial lot 30002 at Derby, and placed into LM Region traffic in June 1952. Withdrawn in October 1972 and returned to traffic in May 1974. It was only placed into WR stock in January 1983 and withdrawn one month later. Scrapped by Bird Group in October - November 1985. 24109 was also present, with similar history, although it was transferred to the WR in May 1982. In the background are Southern Region Ferry Vans. I rather think that I saw burned out 4-CEP power car 61871 from unit 7204 here, but cannot find my record of this, possibly because it was not listed in most spotting books.